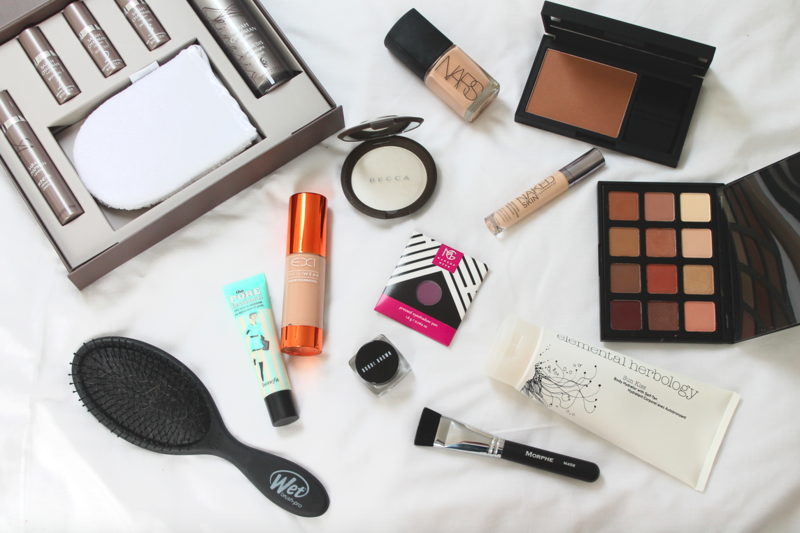 Beauty shopping is one of my favourite things to do, with so many new releases it’s hard to keep up, however I went shopping a couple of weeks ago and managed to pick up a few new bits. Space NK, Harvey Nichols, Topshop and Bobbi Brown were the main shops I visited but then I did an online order from Nars and Beauty Bay. Quick disclaimer again as I mentioned in this post, I do work for Space NK so therefore I get a big discount on the products there. Note: This post is going to be very long so get yourself a cup of tea and sit comfy. The main reason for this haul is because I wanted to purchase the Sarah Chapman Facial-In-A-Box (£62), I have been testing out a few of the Sarah Chapman skincare products and I have been loving them. When I saw this box I instantly ordered it in, it has two of my faves; the overnight exfoliating booster and the overnight facial in it. The overnight facial being a full size product. I’ll be doing a full post about this box because I’m loving it at the moment. Also from Space Nk I picked up another Becca Pressed Shimmering Skin Perfector (£32), I got the new shade Pearl. This is stunning, it does look really light in the pan but it’s gorgeous on the skin. I like to layer this highlighter with Champagne Pop to create an intense highlight. If you’ve been around these parts for a while you will know my love for Nars Sheer Glow (£31), I have two bottles on the go with my normal everyday shade. I had to finally pick it up in my tan shade because it’s coming up to summer now and I’m always looking for more warmth within my foundation. Lastly from Space NK I was very kindly gifted the Elemental Herbology Sun Kiss (£25)*, this is a body hydrator with self-tan, I’ll report back once I’ve tried it. We all know I love my fake tan so I’m excited to try this one. Even though I get discount on Nars products at Space NK, I also get it off there online store for being a student makeup artist. When my friend Victoria (check out her blog here) and I saw the new Spring Summer collection from Nars we couldn’t wait until it came in to Space NK stores, so I made an online order straight away. We picked up the Laguna Tiare Bronzer (£39), I have already raved about Laguna here on WLL but i just love it. This limited edition compact has a mini ITA brush with it and the product is scented, you can read more about it here on the Nars website. Whilst in Harvey Nichols I picked up another fave, Urban Decay Naked Concealer in Light Warm (£17.50). This is my second tube because this stuff is so amazing. I finally brought myself the full size of Benefit Porefessional (£24.50), I have had many testers of this product and loved it but never made the purchase, so glad I finally did. From Beauty Bay I picked up an eyeshadow palette from Morphe, there 12NB palette (£11.95) has been in my basket for a while so I finally made the purchase, I’ll be again posting a review about this palette once I’ve tried it out. I have an addiction to Makeup Geek eyeshadow (£4.95), I think that they’re up there in my top 3 eyeshadows. They’re extremely pigmented and the colour pay off is incredible. Every time I make a Beauty Bay order I at least buy one new shade, this time I picked up Curfew. It’s a gorgeous matte purple shade, can’t wait to create some looks using this. Morphe brushes are also some of the best, I have a little collection now. I have had this one in my basket for a while, it’s the M458 (£7.95), this is ideal for contouring or cleaning up the contour line with powder. Lastly from Beauty Bay I finally picked up a wet brush (£12). I have a tangle teaser but I find that this doesn’t get rid of all of my knots that easily so I wanted to give this one a go. This brush is incredible, it combs through my hair like a dream it makes it feel super soft and knot free. From Bobbi Brown I picked up one of there long wear cream eyeshadow bases (£19), I picked up the shade Velvet Plum. I went to London a couple of weeks ago and forgot to pack any eyeshadows, who does that? So this was an emergency panic buy but it’s a gorgeous shade. My last purchase was from Topshop, I managed to pick up the EX1 Invisawear foundation (£12.50). I’ve heard a lot about this product so I’m very excited to try it out. I got the shade F100. I hope this post wasn’t too long for you, I’m now on a serious spending ban as I go to New York in a couple of months so desperately need to save my money for then. Have you tried any of these products before? Also I would love to know what your recent purchases were.